Get away in comfort and style to an all-inclusive Royalton Luxury Resorts vacation on spectacular beachfronts in Mexico and the Caribbean. Indulge in a family-friendly or adults-only getaway, where you’ll be delighted by the food, entertainment and service both day and night. Delta Vacations gives you more ways to rack up miles, and earn toward your Medallion® Status. SkyMiles® Members earn 1,000 bonus miles per person, in addition to credited flight miles, with a flight and hotel package. If you’re not already a SkyMiles Member, enroll today to start collecting your miles. *Sample Pricing: This offer is available from hundreds of origin cities, but this price, which reflects the offer, is based on travel between Atlanta and Punta Cana, staying in a Premium Room at the Grand Memories Splash Punta Cana. Price is per person, based on double occupancy and select Thursday departures and Sunday returns, June 27 – 30, 2019, and is subject to change. Additional restrictions and baggage charges may apply. See Terms and Conditions for details. Your All-In Luxury® vacation starts by partaking in activities, sports and entertainment programs. Then indulge in extensive, unlimited, reservation-free dining and drink services. 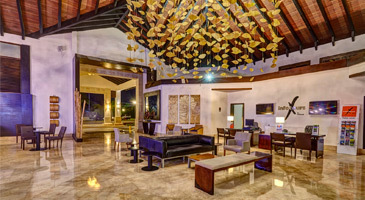 Royalton Riviera Cancun is comprised of three distinct sections, each unique to guests’ needs and vacation styles. Enjoy exclusive amenities, such as personal butler service, exclusive beach area with dedicated bar and waiter service, personalized check-in/check-out, and more when staying in the Diamond Club™ section. Located only a short walk away from one of the most pristine and beautiful stretches of Bavaro Beach, Grand Memories Punta Cana is perfectly situated in a lush tropical setting, offering a new concept in all-inclusive resorts with unparalleled service and deluxe accommodations that perfectly fit into the genuine and magical ambience of the Caribbean coast. This resort offers the savvy traveler access to a beautiful beach, golden sand and an abundance of accommodation options with high-quality amenities. Grand Memories Punta Cana caters to both couples’ and families’ unique vacation needs. A lush paradise on the stunning Caribbean coast, Royalton Bavaro is uniquely designed, and offers a lazy river, kids pool, onsite spa and fitness center. All-In Luxury® provides guests unlimited reservation-free dining, premium drinks and so much more. Indulge your senses in beautiful Dominican Republic, and experience All-In Luxury® amenities and a picturesque tropical setting. Situated on the white sands of Bavaro Beach, Royalton Punta Cana is the destination of choice for vacationers with a penchant for comfort and style. Sitting on a breathtaking, clear-water beach, Royalton Negril masterfully blends Jamaica’s unique culture with exceptional service, creating an oasis for adults and children. With activities to suit every member of the family, the resort features a kids club, splash park and a teens club. 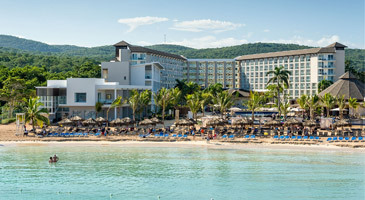 This all-inclusive, 228-room resort is located on a beautiful stretch of powdery beach. Nestled against lush, green mountains, the resort features exquisite restaurants and exciting daily and nightly entertainment. Guests also have full exchange privileges at neighboring Royalton White Sands. Awaken your senses by experiencing All-In Luxury®. With powdery beaches and lush vistas, this resort in a Caribbean paradise promises an extraordinary vacation that combines the charm of Jamaica’s island culture with outstanding service and incredible attention to detail. Each guest will enjoy upscale style and comfort. Built for travelers of all ages, this modern resort features three distinct sections: a family-friendly vacation experience in the general resort; a higher level of service and exclusive pool, beach and dining areas with Diamond ClubTM; and the adults-only oasis Hideaway. Service may be operated by Delta Air Lines®; the Delta Connection® carriers: Compass Airlines, Endeavor Air, Inc., GoJet Airlines, Republic Airlines and SkyWest and Delta Shuttle® carriers: Republic Airlines and Compass Airlines; SkyTeam partners: Aeromexico® or codeshare partners: AerolÃ­neas Argentinas, Aerolitoral dba Aeromexico Connect, Aeromar, Austral Lineas Aereas dba Aerolineas Argentinas, Bahamasair, Gol, Seaborne Airlines, SwiftAir, WestJet, and WestJet Encore. *Price is per person, based on double occupancy in a Premium Room at the Grand Memories Splash Punta Cana, between Atlanta and Punta Cana. Thursday departures and Sunday returns via nonstop service on Delta and certain Delta codeshare partners, and is valid for specific travel dates June 27 – 30, 2019. Advance purchase requirements vary. Other travel days and dates and accommodations are available at other prices. May require travel on specific flights or times; blackout dates may apply. Purchase any Delta Vacations flight and Royalton Luxury Resorts package from any Delta Vacations origin in the U.S. or Canada to Mexico, the Dominican Republic, Jamaica, or Saint Lucia, April 10 – May 31, 2019, for travel April 10 – December 31, 2019. At time of reservation, you must refer to promotional code DV32782. 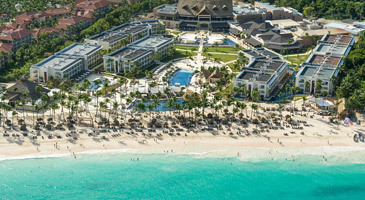 Participating hotels include: Mexico: Riviera Maya – Royalton Riviera Cancun Resort & Spa. Dominican Republic: Punta Cana – Grand Memories Punta Cana, Royalton Bavaro Resort & Spa and Royalton Punta Cana Resort & Casino. Jamaica: Montego Bay – Royalton Blue Waters Montego Bay and Royalton White Sands Montego Bay; Negril – Royalton Negril Resort & Spa. Saint Lucia: Royalton Saint Lucia Resort and Spa. Minimum package purchase of $2,201 per booking is required. Package purchase includes flight and hotel; or flight, hotel and car rental, plus any optional activities. Discount is $65 off bookings of $2,201-$3,800; $100 off bookings of $3,801-$4,500; $150 off bookings of $4,501-$6,749; and $225 off bookings of $6,750 or more. Maximum discount is $225 off per booking; discount is a percentage of each eligible land component. Enter promotional code DV32782 in the Promo Code/eCertificate box on the Booking page. Applicable room categories: Luxury Junior Suite; Luxury Junior Suite Ocean View; Luxury Junior Suite Swim-Out; Luxury Suite with Terrace Jacuzzi; Luxury Suite Ocean View with Terrace Jacuzzi; and Luxury Suite Swim Out. Applicable room categories: Luxury Junior Suite Diamond Club; Luxury Junior Suite Ocean View Diamond Club; Luxury Suite Ocean View with Terrace Jacuzzi Diamond Club; Luxury Suite Swim Out Diamond Club; Honeymoon Suite Ocean View Diamond Club; and Luxury Presidential One Bedroom Suite Ocean View Diamond Club. Receive $600 in resort credits per room, per stay, to be used toward the following: $80 coupon for a room upgrade; four $25 coupons for a culinary experience; four $25 coupons for a spa treatment; $10, $15 and $25 coupons for a tour, four $20 coupons for wine purchase; two $15 coupons for wine purchase; two $25 coupons for a special package (anniversary, birthday celebration, etc. ); two $25 coupons for a beach cabana; and two $30 coupons for a romantic dinner. 3-night minimum stay required in Diamond Club Level Rooms. Resort coupons are non-transferable, and cannot be redeemed for cash. Resort coupons cannot be held over for future stays, and are subject to change. Book and travel by December 22, 2020. Applicable room categories: Luxury Junior Suite, Luxury Junior Suite Ocean View, Luxury Junior Suite Swim-Out, Luxury Suite with Terrace Jacuzzi, Luxury Suite Ocean View with Terrace Jacuzzi, Luxury Family Suite Ocean View, Luxury Presidential One-Bedroom Suite Ocean View, Luxury Presidential One-Bedroom Suite Swim-Out, Luxury Presidential Two-Bedroom Suite Ocean View and Luxury Presidential Two-Bedroom Suite Swim-Out. Receive $300 in resort credits per room, per stay, to be used toward the following: $40 coupon for a room upgrade; two $25 coupons for a culinary experience; two $25 coupons for a spa treatment; three $10 coupons for a tour; three $15 coupons for wine purchase; $30 coupon for a special package (anniversary, birthday celebration); $25 coupon for a beach cabana; $30 coupon for a romantic dinner. Applicable room categories: Luxury Junior Suite Ocean View - Diamond Club™, Luxury Suite Ocean View with Terrace Jacuzzi - Diamond Club™, Luxury Presidential One Bedroom Suite - Diamond Club™, Luxury Presidential One-Bedroom Suite Ocean View - Diamond Club™, Luxury Presidential One-Bedroom Suite Ocean View - Diamond Club™, Luxury Presidential Two-Bedroom Suite Ocean View - Diamond Club™, Luxury Chairman's Two-Bedroom Suite Ocean Front - Diamond Club™, Luxury Family Suite Ocean View - Diamond Club™, Luxury Junior Suite Swim-Out - Diamond Club™ and Luxury Presidential Two-Bedroom Suite Swim-Out - Diamond Club™. Receive $600 in resort credits per room, per stay, to be used toward the following: $80 coupon for a room upgrade; four $25 coupons for a C/X culinary experience; four $25 coupons for a spa treatment; $10, $15 and $25 coupons for a tour; four $20 coupons for wine purchase; two $15 coupons for wine purchase; two $25 coupons for a special package (anniversary, birthday celebration, etc. ); two $25 coupons for a beach cabana; and two $30 coupons for a romantic dinner. Applicable room categories: Luxury Room and Luxury Junior Suite. Receive $300 in resort credits per room, per stay, to be used toward the following: $40 coupon for room upgrade; two $25 coupons for a C/X Culinary experience; two $25 coupons for a spa treatment; three $10 coupons for a tour; three $15 coupons for a wine purchase; $30 coupon for a special package (anniversary, birthday celebration, etc. ); $25 coupon for a beach cabana; and $30 coupon for a romantic dinner. Applicable room categories: Luxury Presidential One-Bedroom Suite - Diamond Club™ , Luxury Junior Suite Ocean View - Diamond Club™ and Luxury Junior Suite Swim-Out - Diamond Club™. Receive $600 in resort credits per room, per stay, to be used toward the following: $80 coupon for a room upgrade; four $25 coupons for a C/X culinary experience; four $25 coupons for a spa treatment; $10, $15 and $25 coupons for a tour; four $20 coupons for a wine purchase; two $15 coupons for a wine purchase; two $25 coupons for a special package (anniversary, birthday celebration, etc. ); two $25 coupons for a beach cabana; and two $30 coupons off for a romantic dinner. Receive $150 in resort credits per room, per stay, to be used toward the following: $50 coupon for room upgrade; $25 coupons for a C/X culinary experience (purchase one and get $25 off second); $25 coupon for a spa treatment (valid on beauty salon and spa treatments); three $10 coupons for a tour and two $10 coupons for a wine purchase. Applicable room categories: Premium Room - Diamond Club™, Premium Jacuzzi Junior Suite - Diamond Club™ and Presidential Jacuzzi One-Bedroom Suite - Diamond Club™. Receive $600 in resort credits per room, per stay, to be used toward the following: $80 coupon for a room upgrade; four $25 coupons for a C/X culinary experience; four $25 coupons for a spa treatment; $10, $15 and $25 coupons for a tour; four $20 coupons for a wine purchase; two $15 coupons for a wine purchase; two $25 coupons for a special package (anniversary, birthday celebration, etc. ); two $25 coupons for a beach cabana; and two $30 coupons for a romantic dinner. Applicable room categories: Premium Room Diamond Club, Premium Jacuzzi Junior Suite Diamond Club and Presidential Jacuzzi One Bedroom Suite Diamond Club. Resort coupons are non-transferable, and cannot be redeemed for cash. Resort coupons cannot be hold over for future stays, are are subject to change. Applicable room categories: Luxury Junior Suite, Luxury Junior Suite Ocean View, Luxury Junior Suite Swim-Out, Luxury Family Suite and Luxury Presidential One-Bedroom Suite. Applicable room categories: Luxury Room - Diamond Club™, Luxury Ocean View Room - Diamond Club™, Honeymoon Jacuzzi Suite - Diamond Club™ and Luxury Swim-Out Room - Diamond Club™. Applicable room categories: Luxury Junior Suite - Diamond Club™, Luxury Junior Suite Ocean View - Diamond Club™, Luxury Junior Suite Swim-Out - Diamond Club™, Luxury Family Suite Ocean View - Diamond Club™, Luxury Presidential One-Bedroom Suite - Diamond Club™ and Luxury Presidential Two-Bedroom Suite - Diamond Club™. Applicable room category: Luxury Room. Applicable room categories: Luxury Room - Diamond Club™, Luxury Swim-Out Room - Diamond Club™, Luxury Ocean View Room - Diamond Club™, Luxury Presidential Jacuzzi One-Bedroom Suite - Diamond Club™, Luxury Presidential Jacuzzi Two-Bedroom Suite - Diamond Club™, Luxury Presidential Jacuzzi Swim-Out One-Bedroom Suite - Diamond Club™, Honeymoon Jacuzzi Suite - Diamond Club™ and Chairman's Two-Bedroom Ocean Front Suite - Diamond Club™. Applicable room categories: Luxury Junior Suite Ocean View, Luxury Junior Suite Swim-Out and Luxury Presidential One-Bedroom Ocean View. Receive $300 in resort credits per room, per stay, to be used toward the following: $40 coupon for room upgrade; two $25 coupons for a C/X culinary experience; two $25 coupons for a spa treatment; three $10 coupons for a tour; three $15 coupons for wine purchase; $30 coupon for a special package (anniversary, birthday celebration, etc. ); $25 coupon for a beach cabana; and $30 coupon for a romantic dinner. Applicable room categories: Junior Suite Ocean View - Diamond Club™, Junior Suite Swim-Out - Diamond Club™, Luxury Presidential One-Bedroom Ocena View - Diamond Club™ and Luxury Penthouse One-Bedroom Suite Ocean View - Diamond Club™. Applicable room categories: Luxury Junior Suite, Luxury Junior Suite Ocean View, Luxury Junior Suite Swim-Out, Luxury Family Suite Ocean View Luxury Presidential One-Bedroom Suite Ocena View and Luxury Presidential Two-Bedroom Ocean View. Applicable room categories: Luxury Junior Suite Ocena View - Diamond Club™, Luxury Junior Suite Swim-Out - Diamond Club™, Luxury Family Suite Ocean View - Diamond Club™ Luxury Presidential One-Bedroom Ocean View - Diamond Club™, Luxury Presidential One-Bedroom Swim-Out - Diamond Club™, Chairman Two-Bedroom Ocena Front Suite - Diamond Club™ Luxury Penthouse One-Bedroom Suite Ocean View - Diamond Club™ and Luxury Presidential Two-Bedroom Ocean View - Diamond Club™. Receive $300 in resort credits per room, per stay, to be used toward the following: $40 coupon for room upgrade; two $25 coupons for a C/X culinary experience; two $25 coupons for a spa treatment; three $10 coupons for a tour; three $15 coupons for a of wine purchase; $30 coupon for a special package (anniversary, birthday celebration, etc. ); $25 coupon for a beach cabana; and $30 coupon off romantic dinner. Applicable room categories: Luxury Junior Suite Ocean View - Diamond Club™, Luxury Junior Suite Swim-Out - Diamond Club™, Luxury Presidential Ocean View One-Bedroom Suite - Diamond Club™, Luxury Presidential Ocean View Two-Bedroom Suite - Diamond Club™ Chairman's Ocean View Two-Bedroom Suite - Diamond Club™ and Chairman's Ocean View Three-Bedroom Suite - Diamond Club™. Applicable room categories: Luxury Room, Luxury Ocean View Room and Family Jacuzzi Ocean View Suite. Applicable room categories: Luxury Ocean View Room - Diamond Club™, Family Jacuzzi Ocean View Suite - Diamond Club™, Luxury Junior Suite Ocean View - Diamond Club™, Luxury Junior Suite Swim-Out - Diamond Club™, Luxury Presidential Jacuzzi Ocean View One-Bedroom Suite - Diamond Club™, Luxury Presidential Jacuzzi Ocean View Two-Bedroom Suite - Diamond Club™, Luxury Presidential Jacuzzi Swim-Out Pool View One-Bedroom - Diamond Club™ and Luxury Presidential Jacuzzi Swim-Out Pool View Two-Bedroom Suite - Diamond Club™. Applicable room categories: Luxury Junior Suite, Luxury Junior Suite Ocean View, Luxury Junior Suite Swim-Out and Luxury Presidential One-Bedroom Ocean View. Applicable room categories: Luxury Junior Suite - Diamond Club™, Luxury Junior Suite Ocean View - Diamond Club™, Luxury Junior Suite Swim-Out - Diamond Club™ and Luxury Presidential One-Bedroom Ocean View - Diamond Club™. Applicable room categories: Luxury Junior Suite, Luxury Junior Suite Ocean View, Luxury Junior Suite Swim-Out, Luxury Family Suite Ocean View and Luxury Presidential One-Bedroom Ocean View. Applicable room categories: Luxury Junior Suite - Diamond Club™, Luxury Junior Suite Ocean View - Diamond Club™, Luxury Junior Suite Swim-Out - Diamond Club™, Luxury Family Suite Ocean View - Diamond Club™ and Luxury Presidential One-Bedroom Ocean View - Diamond Club™.